Oberammergau is not only the home of the famous Passion Play, but this town of 5,500 in the Bavarian Alps south of Munich is also a standalone tourist attraction. Passion Play attendees will have time to do some exploring around town because there’s a three-hour intermission to eat, take a break, shop and familiarize yourself with the village’s highlights. You may also explore the village and other close-by attractions before or after the play. The town, at 2,700 feet in altitude and located on the Ammer River, is widely known for its frescoes, or Lüftlmalerei, with traditional Bavarian themes such as religious scenes and fairy tales. These colorful paintings on various buildings add a unique flavor to this little town. Oberammergau is also well known for its many wood craftsmen who carve intricate pieces and sell them; many are of a religious nature. Local merchants act as the outlet for these carvings. At the Oberammergau Museum you can learn the history of wood carving and see historical nativity sets, modern art and special exhibitions. The onion-domed Church of Saints Peter and Paul is a local attraction that was consecrated in 1749 and designed by well-regarded German architect Joseph Schmuzer. Admire the grandeur of the interior and its ample use of marble and gold. Striking murals, created by the famed Matthew Guenther, depict the Lord’s Prayer and Ave Maria. It’s worth taking a short walk through the church cemetery with its interesting headstones. The Pilatushaus, a large two-story structure, is known as a “living workshop” with various artisans doing carvings, making pottery and producing other crafts using traditional techniques. Enjoying a traditional German meal is part of the fun of visiting Oberammergau. During the play’s intermission, you’ll find vendors offering light foods and refreshments. If you’re with a group, your sit-down meal will likely be pre-arranged. If you’re on your own, chances are the major restaurants will not be able to accommodate you during heavy traffic periods. For a sweet taste treat, head to Brandmeier Bäckerei (bakery). It is said the rolls and pastries here are excellent because all the flour used comes from farmers in the immediate area. The bakery also uses fresh milk and cheese products from local farmers. 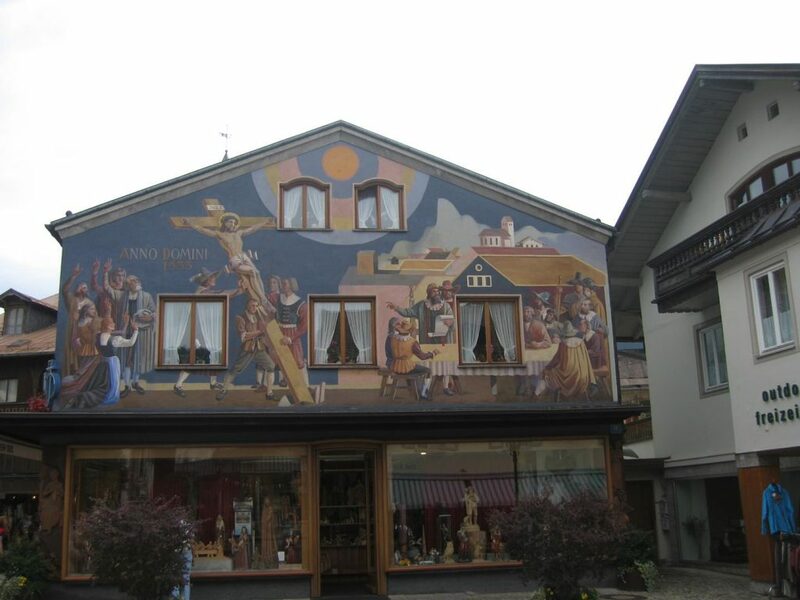 Baur Anton is a key decorative arts store with souvenirs, gifts, etchings, woodcarvings, madonnas, saints, nativity scenes and ceramics. Many of the pieces are roughed in by machine, then finished by hand. 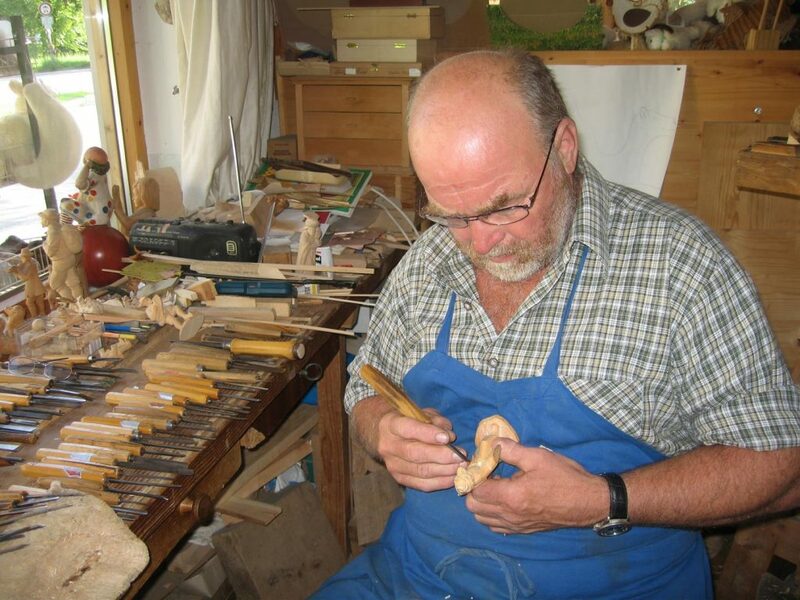 The Schnitzschule (Woodcarving School) in town teaches students the woodcarving craft. Some of the students’ works are put on exhibit, others are sold.